Audi’s intrigue-filled “Night Watchman” spot topped the charts in automotive commercial spending in October. 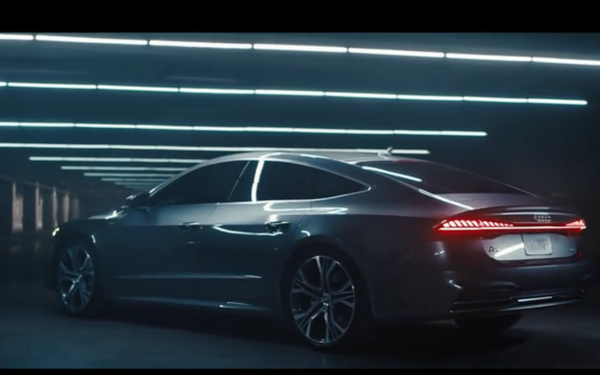 The spot for the Audi A6 ends with the tagline “Progress Is Never Satisfied.” The brand spent $12.89 million on 1,920 airings of the spot during the month, according to TV data company Alphonso. Chevrolet came in second with just shy of $10.5 million spent on 4,637 airings of a spot for the Chevrolet Silverado pickup truck. The nameplate also came in tenth with 694 airings and a spend of $5.7 million on a spot for its Chevrolet Equinox crossover utility vehicle. Both spots fall under the “Find New Roads” banner. “The Audi A6 drove off with the highest TV commercial spend in October, but looking carefully at the top 10 spenders, it is clear that Chevrolet is trying to make some headway, airing two different commercials starring real people rather than actors, with a total spend of nearly $17.5 million,” TS Kelly, senior vice president of research for Alphonso, tells Marketing Daily. Rounding out the top 10 are Honda in third with a multi-vehicle spot for its CR-V, HR-V and Pilot with 1,689 airings and a spend of just over $10 million. Kia is in fourth with 1,904 airings and just under $10 million for “Unruled” featuring the 2019 Forte. Two luxury brands grabbed the 7th and 8th spots. Cadillac spent $6.2 million on 2056 airings for “Joy,” a spot for the XT4, and Infiniti spent just shy of $6 million on 1.719 airings of its “Empower The Drive, Start Your Own Summer Legacy” dealer event spot, which featured the QX50.